Kevyn Aucoin Sample Sale Part Deux! THIS FRIDAY ONLY!!! 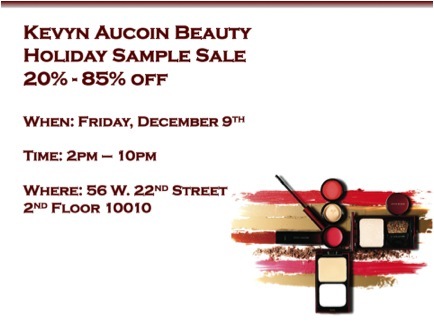 Get ready I’ve been notified that Kevyn Aucoin beauty will be holding one final sample sale for the year THIS FRIDAY!!! Yes I’m excited too. If you remember I hauled a whole lot of makeup for my kit from them back in the summertime see here. I swatched almost everything they had except the foundation will I will make my business to do this time around for future reference if you’re in the NYC area or close by make sure to make a visit because you will not be disappointed I promise you. I will be in the premises of course and will be taking lots of pics so make sure to bring your best smile oh and a wallet full of cash or cards. See you then! Info is below comment let me know if you’re coming. 2 Comments on Kevyn Aucoin Sample Sale Part Deux! THIS FRIDAY ONLY!!! See ya there Merli. My goal is to get fair shade foundations. I couldnt afford the ones at the holiday pop show. once I have the foundations my kit is complete. Awesome T see you there!